Where did the world of Ethshar come from? Was it originally a gaming design? So how come there's no role-playing game based on it? Are there maps of Ethshar? How come the maps haven't been published anywhere? Okay, so if you aren't going to give us a better map, can you tell us something about the geography? So just how many Ethshar stories are there? Then why can't I find them? Are more Ethshar stories in the works? What if you do find a publisher? Is there anything we can do to help get these written? Are you ever going to collect all the short Ethshar stories in one place? Are you going to write a story about the break-up of Old Ethshar? Are you going to explain how witchcraft and warlockry interrelate? You've written stories about wizards and warlocks and witches; when are you going to tell us more about sorcery? What about the other kinds of magic? What's the difference between a wizard and a sorcerer? Why doesn't the cover of The Unwilling Warlord have anything to do with the book? For a quick exit, click here. Where did the world of Ethshar come from? Was it originally a gaming design?. Ethshar was created, or at least developed, with gaming in mind, as well as fiction -- though when I drew the original map back in high school I didn't have much of anything in mind except keeping myself busy during a boring geometry class. 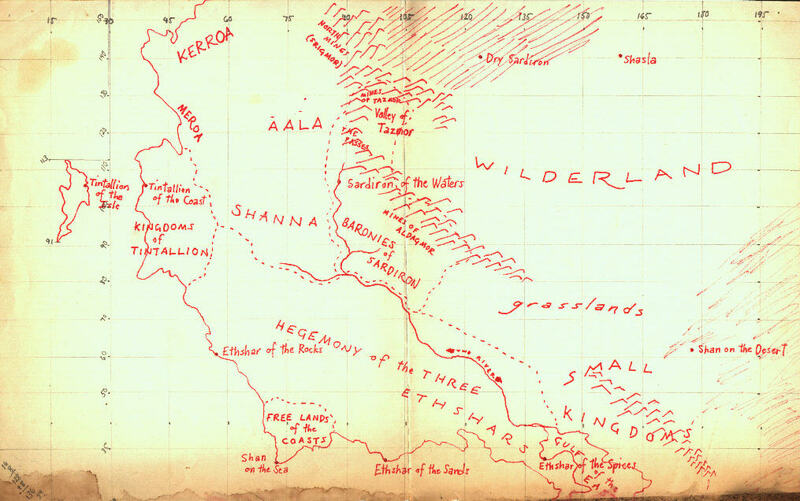 In 1977, though, when I took that old map and started turning it into a world, I had in mind both gaming and fiction. The problem was that I got so involved in the complexities of what I was inventing that it became unplayable as a regular face-to-face game; an hour or so of game time could consume days of real time. So I switched to play-by-mail, and that worked, after a fashion, for a couple of years. In 1980, though, a housefire destroyed my original set of maps (you'll notice the very first map, as posted here, is visibly damaged; the others, which were still in use instead of stuck in a drawer, were completely destroyed) and most of the records. Since I'd sold my first two novels by then and given up other gaming, I never tried to revive the campaign; since then, Ethshar's only been used for fiction. It works better for stories, in any case; in the original form it was never very practical as a game. Every so often someone suggests that I sell the gaming rights to someone. Well, I wouldn't mind doing that, if there was enough money involved and I was convinced the buyer would do a good job. So far, no one who's expressed interest has met those two criteria. If you think you might, you're welcome to try, but you'll need to convince my agent, who's hardnosed about this sort of thing. Yes, there are maps. The first set was destroyed in our 1980 housefire, but I redrew them, of course, working from scorched fragments and memory. They're very large; the smallest is 18" x 24". They're done in colored pencil; it doesn't reproduce well at all. I've got detailed maps in various scales of the World as a whole, the Hegemony of the Three Ethshars, and the Small Kingdoms, and street maps of every city with a population over 10,000. Actually, a map of the Empire of Vond probably should have been included in The Unwilling Warlord, but, frankly, I forgot when I was packing up the manuscript for submission. I did include a map of the Empire of Vond as an insert in the limited edition of The Vondish Ambassador, but once again forgot to send it to the publisher for the regular edition. There's no map in, say, The Spell of the Black Dagger because the whole story takes place in a single city. Several of the novels really cover fairly small areas. Besides, if I did include an accurate map, you'd see that the map wouldn't necessarily agree with what the characters in the novel believe. This is because the characters are wrong. Ethsharitic cartography isn't very good, and the teaching of geography isn't given a high priority in most families. But hey, while sorting through old files awhile back, I made a discovery -- I found the original map I drew in my high school geometry class! It's somewhat battered and fire-damaged, but at least you can see it. This isn't exactly the same as the final version, and it doesn't show any detail at all in the Small Kingdoms, but at least it'll give you map-hounds a start. "Night Flight": Included in Flights of Fantasy, edited by Mercedes Lackey, DAW Books, December 1999. Night of Madness: Tor, November 2000. Ithanalin's Restoration: Tor, December 2002. The Spriggan Mirror: Wildside Press, 2007; the first draft was posted online as a reader-supported serial. The Vondish Ambassador: Misenchanted Press limited edition, 2007; the first draft was posted online as a a reader-supported serial. "The God in Red": First published in a chapbook as my family's holiday card for 2007; now available online. "The Warlock's Refuge": First published online for International Pixel-Stained Technopeasant Day, April 23, 2010; the online version is effectively first draft. This story was incorporated into The Unwelcome Warlock as the first chapter of the novel. The Unwelcome Warlock:	Wildside Press, January 2012; the first draft was posted online as a reader-supported serial.. The Sorcerer's Widow: Wildside Press, October 2013; the first draft was posted online as a reader-supported serial..
Relics of War: Wildside Press, December 2014; the first draft was posted online as a reader-supported serial. "The Frog Wizard": Written in multiple versions; a non-Ethshar one was published in the January 1993 issue of Science Fiction Age, but the Ethshar version first appeared in Tales of Ethshar, Wildside Press, March 2012. "The Unwanted Wardrobe": Not really a story; my April Fool's joke for 2011. I include it here (and in Tales of Ethshar) only for the sake of completeness. You should be able to. The novels are all available in one form or another from online booksellers, and any bookstore should be able to order them for you, either on paper or as ebooks. As for the short stories, six of them were reprinted in the first six Wildside trade paperbacks as bonus features -- "The Bloodstone" is in the back of The Misenchanted Sword, "Weaving Spells" is in the back of With A Single Spell, "Ingredients" is in The Unwilling Warlord, "Night Flight" accompanies Taking Flight, "Portrait of a Hero" joins The Blood of a Dragon, and "The Guardswoman" follows The Spell of the Black Dagger. Three more are online here: "Sirinita's Dragon", "The God in Red", and "The Warlock's Refuge". I'm afraid I don't know which of those stories are included in the e-book editions; some are, some aren't. Some of the anthologies the stories appeared in may still be available, as well, if you look around. The simple approach, though -- after many years of putting it off I finally collected them all as Tales of Ethshar, which Wildside Press published in March 2012. It's available from the usual suspects, and as of April 2015 it's still all the short Ethshar stories. It generally doesn't matter. Any order you like. Each story is designed to stand on its own. Some, though, do work better if you've read earlier ones. The Spell of the Black Dagger: Refers back to people and events in With A Single Spell, The Unwilling Warlord, and The Blood of a Dragon. The Spriggan Mirror: More or less a sequel to With A Single Spell, and also refers back to Ithanalin's Restoration. The Vondish Ambassador: Follows up on events in The Unwilling Warlord, and to a lesser extent Night of Madness. The Unwelcome Warlock:	A direct sequel to both Night of Madness and The Unwilling Warlord, and follows up on elements of The Vondish Ambassador and The Blood of a Dragon. Probably the worst possible place to start. There are lots of references and cameos connecting the various stories -- the protagonist of The Misenchanted Sword appears briefly in The Blood of a Dragon and Taking Flight, for example, and a very minor character in With A Single Spell turns up in a somewhat more important role in Taking Flight, and so on -- but you won't miss anything important if you don't spot these. If you really must have a recommendation for where to start, I'd choose The Misenchanted Sword, which was the first one written and which is mostly set well before the others in the internal chronology. Yes, but how and when they'll be published is uncertain. As of January 2017, I'm almost done with a big, complicated one called Stone Unturned that combines ideas I'd previously discussed as The Wizard's Garden, The Demon's Master, and A Slave of Wizardry, along with some fresh material. The current plan is for it to be published by Wildside Press. After that, who knows? What if you do find a real publisher? At the Sign of the Crimson Wolf: Valder the Innkeeper is snowbound in Sardiron with an assortment of troublemakers. Azraya of Ethshar: Remember her from With A Single Spell and Taking Flight? No? Well, I do, and here's her life story. A Feather from Her Wing: A young girl in the Small Kingdoms idolizes Irith the Flyer (last seen in Taking Flight). The Rune of the Implacable Stalker: An innocent is accidentally targeted by a vengeance spell. Dumery of the Dragon: A sequel to The Blood of a Dragon -- Dumery and Aldagon encounter complications in trying to carry out their business plan. Kelder the Small: A man who's been turned into a mouse by an angry wizard tries to make a life for himself in his new form. Sharra the Petty: (Title will probably change) A woman tries to use magic to save her failing marriage. There's a faint possibility I might someday repackage the series as a "young adult" series, in which case I could sell some of those, but not all. Not really. Fanmail doesn't hurt. Or if you have about twenty grand to spare, that's what it would cost to convince me to write another Ethshar novel instead of something more commercial. If you do have twenty grand, well, I can find the necessary editorial and production facilities to get into print; it's just the up-front money that's a stumbling block. I did, and Wildside Press published in in March 2012 as Tales of Ethshar. A story about the break-up of Old Ethshar wouldn't be just one story, but dozens. It would resemble what happened to the Soviet Union a little, or maybe the feuding-warlords era in China, though it's not much like either of those, really. It's not that the central government lost control, really, so much as that the central government fell apart, and every local underling tried to take its place. And then those subdivided, and subdivided... I've charted out where some of the Small Kingdoms came from, and it's too long and complicated a process to make for a very good story. I did some of that in The Sorcerer's Widow. Other than that, I have no plans. The minor sorts of magic may never be the basis of stories. They may never get explained at all. Eventually I expect to cover all the major varieties at least somewhat, but I'm not in any hurry to get to any particular sort. In Ethshar there are several different varieties of magic, rather as there are different branches of science in our world. Different authorities count the varieties differently, and come up with anywhere from three to twelve kinds; I make it either five or seven, depending on how I want to count a couple at any given time. These different magicks need different names, so I've called one wizardry, another sorcery, a third witchcraft, and so on. The Northern Empire relied heavily on sorcery, which uses talismans and charms, and demonology, which (obviously) involves summoning demons, while Old Ethshar relied more on wizardry, which uses ritual and incantations, and theurgy, which calls on the gods for help. Why doesn't the original cover of The Unwilling Warlord have anything to do with the book? The art director at Del Rey screwed up. I have a full explanation on another page. Comments? Questions? E-mail me at misenchantedpress@gmail.com.